Myrtle (Nothofagus cunninghamii), otherwise known as Myrtle Beech, Tasmanian Myrtle, Beech, Tasmanian Beech, or Australian Cherry is an Australian hardwood I have found works wonderfully well in my mandolins. Over the last 3 years or so I have made quite a number of mandolins from Myrtle with King William Pine (Athrotaxis selaginoides) tops and Spruce tops. The results have been consistently good, particularly with Spruce, and I would like to encourage other Australian instrument makers to try it, particularly in carved top instruments. Myrtle is a moderately hard and dense timber with a very fine grain texture. It is easily worked, and because of the fine grain texture finishes beautifully. Most pieces are a rather bland pink, but the better pieces are a lovely deep reddish brown and can be highly figured. The figure in Myrtle is broader than the tight fiddleback figure that occurs in Blackwood (Acacia melanoxylon) or the true Maples (Acer sp), but nevertheless is quite attractive. The wood also has an attractive silky sheen look to it under a French polish that is also very attractive. Myrtle can also come as so called "Tiger" Myrtle which is stunning to look at but having never used tiger Myrtle I really can't comment as to it's suitability for music instruments. The black markings in tiger Myrtle I believe are caused by a fungus, so care may be required in using it in musical instruments. Myrtle is somewhat variable in how easily it bends. Some pieces are excellent, but other pieces are so difficult to bend that you may as well give up and try another piece from a different source. It is moderately stiff compared to most Blackwood I have used, so it is important only to use quarter sawn pieces to maximize the stiffness. The dust is no where near as irritating as Blackwood, although of course the usual dust control precautions should be taken. Myrtle is not the easiest timber to dry, it has a tendency to split much more readily than Blackwood, but air dried pieces I have found to be very stable. It is a little heavier than I would like, but the tone I can get out of this timber far outweighs any of the disadvantages. Unlike Blackwood or the Rosewoods (Dalbergia sp), Myrtle is not a particularly resonant timber. It is much more like the true Maples in that respect so it may not work well in instruments such as guitars where more resonant hardwoods such as Rosewood are used. I would expect it would work well in instruments where traditionally Maple is used. Indeed, John Akerman (JAAMIM Sept 1996) has reported success with Myrtle in his violins. Maple is the traditional hardwood used in carved top mandolins so it is no real surprise that it also works well in mandolins. I have tried King William Pine (Athrotaxis selaginoides), Red Spruce (Picea rubens) and European Spruce (Picea abies) together with Myrtle in mandolins and mandolas and one Appalachian dulcimer in King William Pine and Myrtle. In mandolins, I have found that Myrtle does not work so well with King William Pine. I have made two mandolins with this wood combination and both instruments have beautiful tone, but are somewhat lacking in volume and headroom such that I don't like the end result and probably wontt use Myrtle with King William Pine again in mandolins. However, the larger instrument (Mandola) was excellent, as was the Appalachian dulcimer so it is not possible to generalize. With Red Spruce and European Spruce I can say that to date my results have been excellent. I have tried European Maple (Acer pseudoplatanus), Rock Maple (Acer saccharum) and Big Leaf Maple (Acer macrophyllum) as well as Walnut (Juglans californica and Juglans nigra) with Red Spruce and European Spruce, and without any doubt I prefer the sound of Myrtle. One mandolin I made with European Spruce and Myrtle is a real "Rolls Royce" instrument that I am not parting with until I make something better! Hopefully many more instruments of this quality will come from my workshop in the future. So what is it about the tonal qualities of Myrtle that is so appealing? Mellow, sweet, smooth, fine, rich tone all come to mind. From the true Maples, the best tone has come from European Maple, but in comparison to Myrtle it sounds brighter, harder, and thinner with perhaps a bit more clarity. Myrtle also imparts a characteristic "solid" feel to the instrument when it is played such that hard playing does not cause the instrument to distort. 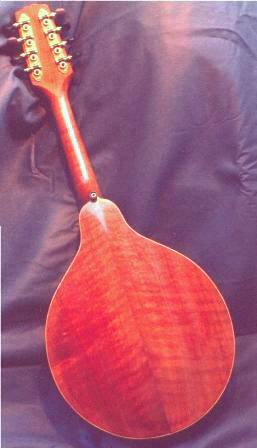 The mandolas with Red Spruce tops have been really loud resonant instruments with excellent tone. It has a particularly sweet sounding treble, but the instruments need to be built to bring that treble out or else the treble may sound weak. Summarizing, Myrtle gives me tonal characteristics that I (and others, fortunately) find particularly appealing, and it has become my favorite hardwood for mandolins and mandolas with Spruce soundboards. Blackwood remains my favorite timber for instruments with King William Pine soundboards.